I’ve been looking forward to posting this for weeks, nay months. I would have to say that this project started out as an entirely different project early on. I stumbled across the idea on Paul Stamatiou’s blog. 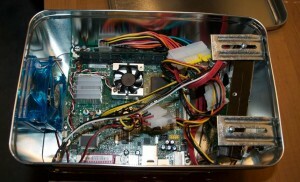 He built a little computer out of a Mini-ITX board and a couple of pieces of plexi-glass. I was pretty amazed at it, and I thought “I would like to do that. That would be cool.” I think as much as I loved the idea of having a NAS,I also wanted a project to do. I enjoy the DIY approach to thing and I love the feeling of accomplishment that comes with it. I think by the time I finished, I had spent a bit more money than I would have if I’d bought a dedicated NAS. The downside to that equation is that no NAS does what this does. 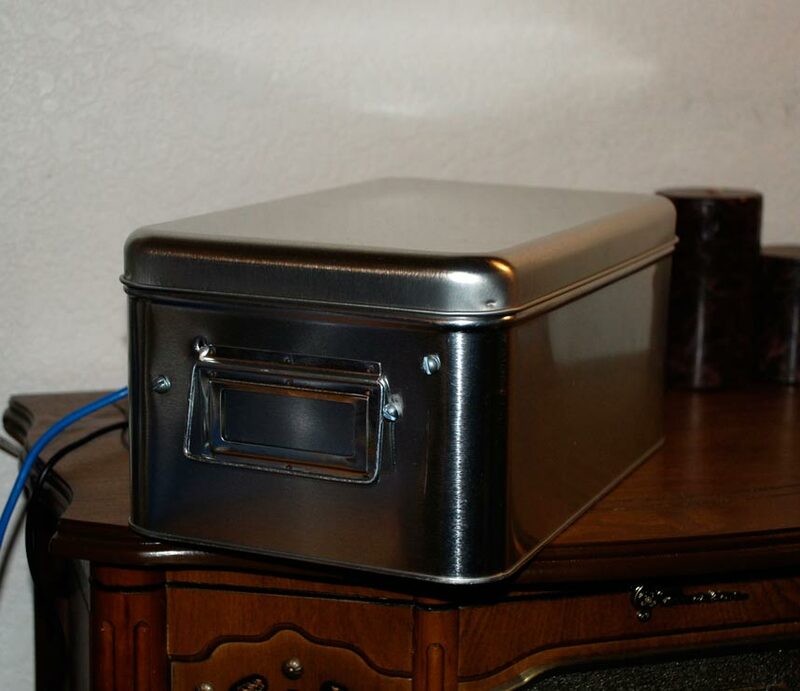 It’s a NAS, and it can be a stand-alone computer as well. I know, the Linux geeks out there are thinking “We can make anything run Linux!”, so getting any old NAS to do it is probably not that difficult, but still I liked the flexibility of a computer for occasions, and a NAS for storage and what-not. I initially was going to go with Paul’s concept of creating an open-air PC and blowing a little air across it to keep it cool. 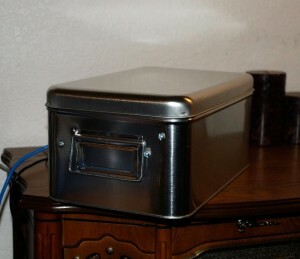 A conversation with my father resulted in some concern over EMI and going with an open-air case. I don’t know the reality of such problems, but I figured I’d skip any problems and build a NAS which would let me by-and-large be able to ignore that. Various mounting hardware. Screws, brackets, etc. All-together, it came out to just above $300. Like I said before, you can get a NAS for cheaper, but less flexible and not nearly as much fun. I got most of the parts (save the PSU and the Ikea box obviously) from NewEgg. I had a bit of a time figuring out what to use as an OS on the NAS. If you’re doing a Homebrew NAS setup, you have a few options. When initially I was exploring this, the first thing to popup was FreeNAS. FreeNAS is a FreeBSD derivative (actually, it’s based off of M0n0wall, which is based off of FreeBSD) designed soley for the purpose of being a NAS. It runs very lightweight, small enough to run on 64mb of memory and less than 32mb of disk space (the size of an old-school USB stick). My first encounter with it I tried to run it on an old PC that I was going to stock full of old hard drives to give me a lot of space to use. Unfortunately, the NIC card in that machine was not supported and so I could never get it to work. Additionally, that machine was incapable of booting off of a USB stick and I was adamant about leaving all possible drive connectors open for storage. 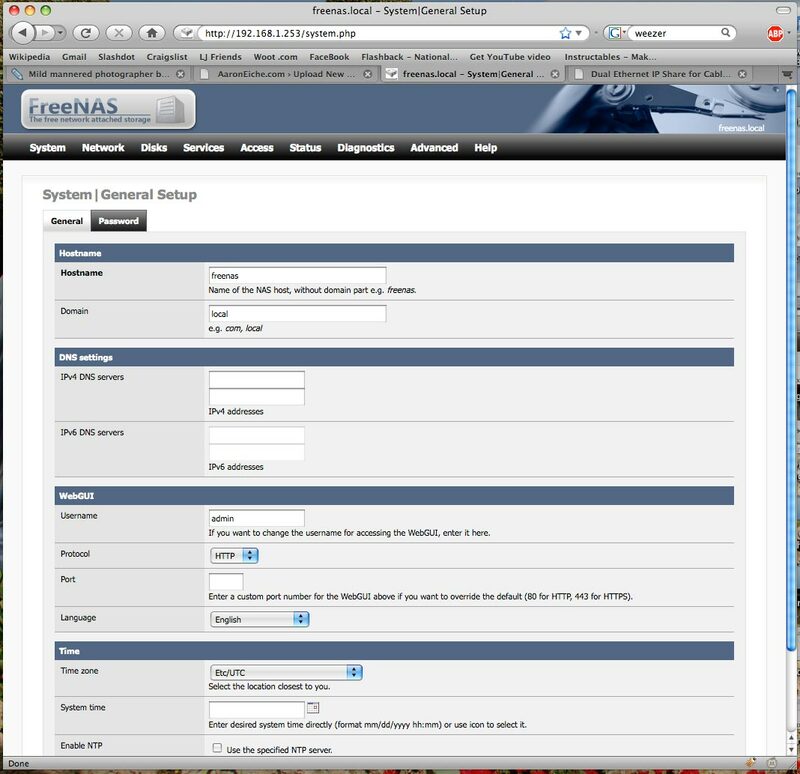 One thing that initially appealed to me is that FreeNAS supported AFP (Apple File Protocol). My household is a Mac household. We’ve got 2 macs right now and I wanted as much compatibility as possible. AFP was important to me. After seeing Paul’s creation, I began to look at my idea differently. Instead of running it off of old out-dated hardware (something it was developed with the intention of) I could run it off of new, super-small hardware. 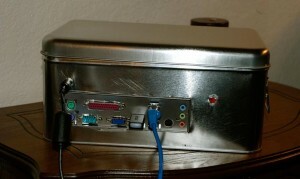 This intrigued me and I began to research the mini-ITX form factor. The Intel D945GCLF2 was the winner, really for one reason: Price. The board came in just short of $85 while similar boards sell at well over $100. When I got everything set up, I ran into a problem. 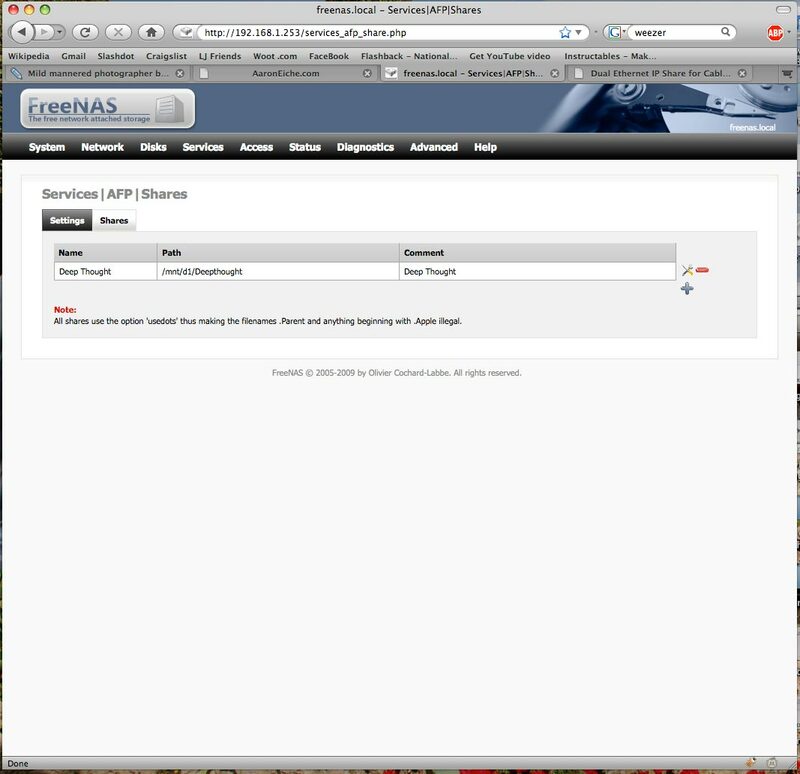 The public build of FreeNAS currently doesn’t support the NIC onboard. The other options floating around didn’t fit for different reasons. There was OpenFiler which is based on Linux, but it didn’t support AFP. There was NASLite2, but NASLite costs money, and I wasn’t ready to spend money when I can… not spend money. So the problem had to be approached with FreeNAS. It turns out, if you’re willing to be a little risky, you can use the nightly build, which is based off of FreeBSD 7, which does support the NIC on board. It took some time to get it set up. I had some trouble understanding how to set up AFP on FreeNAS. 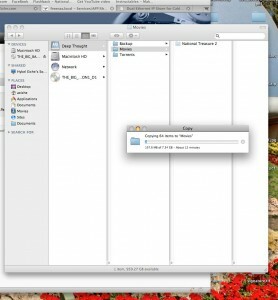 There are Shares and Users and permissions. Between some help and some fanagaling, I managed to get it all to work without much difficulty. It took me a long time to finish this. More than a few hours were spent outside my apartment door with my Dremel in hand (if you have a shop or a bench in your garage, count your many blessings. I look forward to having one myself.) There were some missteps along the way, poorly drilled holes, slightly off measurements. My NAS has worked flawlessly. It’s 1.5TB of space is wonderful, and it’s accessibility is excellent. The only hiccup is my router, which is a 100Mb instead of Gigabit ethernet. My computer and the NAS could handle it though. The server doesn’t broadcast it’s Bonjour name. It does indeed broadcast it’s Bonjour name and it’s tremendously easy to connect to. Looking slick! Unfortunately I stopped using mine.. I pulled the drives out and the rest of it is catching dust in my closet. The thing was just a little too underpowered… yeah yeah don’t need much power for a NAS but I ended up making it my download box so it ended up taking forever and a half to post-process/decompress the downloads. It was just outdated hardware. Now I have a big PC that serves my needs.. but it’s big. I kinda wish it could fit on the media rack next to my PS3 and such. Thanks! I haven’t been keeping mine on 24/7 so far. I think once I get downloads squared I might use it more often. I was tempted to go for Intel’s DG45FC, and make it a server/HTPC. That board is a little killer. HDMI out and 6 SATA ports. The price was a little heavier (plus a separate chip) and I like to play with OSx86 (The video chipset isn’t supported as of yet), so I went with the cheap option. Sorry to hear yours has been retired, but you gotta do what works for ya. I was tempted to go with a used tower and just run everything in there, but there was something appealing about the little box that doesn’t look like a computer. This is a fantastic idea! I’ve been using my old tower as a temporary file server (temporary being over a year now *LOL*), but this seems like a great replacement! I’m actually toying with the idea of repurposing one of the really early netbooks (a lot of places have the eee 7xx series for VERY cheap), though connecting the drives via USB seems like it would impact performance. I think 2.5″ drives aren’t really the workhorses you want for a NAS, and like you said, the capacity isn’t quite there. But in all seriousness, I’m working on costing out this idea – so far, it looks to be coming in a bit cheaper than my original solution, but I suspect I might have to use a different – I’ve got a 701, and it gets pretty hot after a while, so I’m going to have to figure out how to mount the drives and laptop and still give everything the necessary cooling. Hi.I just wanted to take a minute to tell you that I enjoyed this blog post. I just stumbled onto it through MSN, and will be checking out the rest of your blog. Hey there, loved the story, gonna build one of my own with an old computer that was lying around… I’m just wondering, will it be possible to use an external hard drive as the main hard drive (without disassembling it)? I have a 1TB external Seagate HDD and would like to have it as sort of an auxillary storage in addition to the on board HDD. Any idea if this is possible? Thanks! That should work just fine, as long as your computer can boot from the drive. Personally, I prefer to keep the operating system on a disk separate from storage. If your computer is able to boot off of a USB key, I’d recommend that approach. FreeNAS only takes 64MB to install, and if something terrible happens to the OS, you can just reinstall it without affecting any of your data. If I can help any more, let me know. Good luck! I have played with FreeNAS in the past, but never put a box into production. I was wondering if you have played with the integrated UPnP media server? I’m messing around with some other stuff at the moment, but I have a grand vision for utilizing the NAS as a centerpiece for the network at home. Between it, my router and the modem, I envision some really cool interconnectedness. 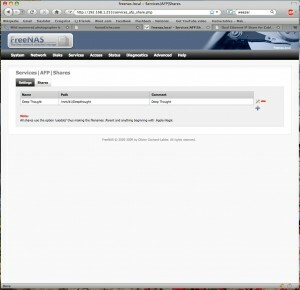 Looks like “Learning FreeNAS” ebook is the best kept secret on the Web. Not available in the NL, CN and RU domains as well ….. There are a couple of a reasons. First, I wanted some expandability. I can fit at least 2 drives in the Ikea box as it is, possibly 3. Second is that I wanted a project to do. I could have gone out and bought a case, that would have made it super simple. But I didn’t want to buy a case, I wanted to make something. 1. why did you choose that mobo instead of Intel D510MO? 2. why did you build your own chassis instead of buying a chassis with its own psu, I’m thinking of something like Apex MI100 that goes for about 40 $. Sure the Ikea box is cheaper but when you factor the psu in it’s almost twice as expensive. Just realised how old this post is. All these things probably didn’t exist. Not at all. They’re valid questions. The answer to the first one is obvious, but the second one I think still has merit. The case was for the most part a matter of doing something myself. It was a challenge. As it goes, I’ve since moved the components out of the Ikea box and into a 1U server rack case. I got the case on sale from a local surplus store and it’s perfect for my setup. 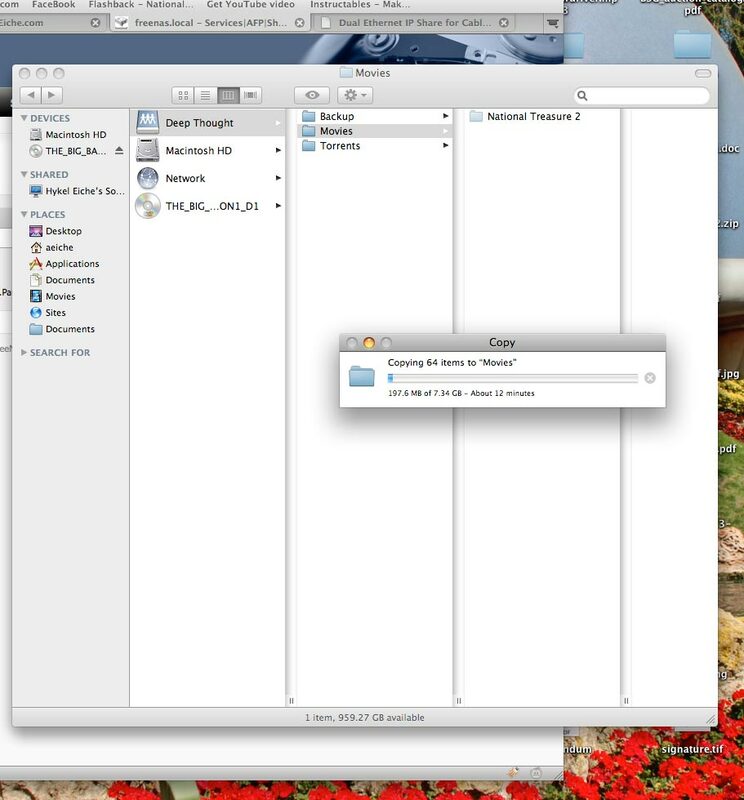 I’ve moved from 1 drive to 4. I’m looking to replace the Mother board with a Jetway JNC9C-455-LF. It shares a lot with the D510MO, but has 4 onboard Sata connectors. How many hard drives would fit in your unit? I’m looking for a DIY case, very similar to yours (AFP, FreeNAS, low power), but I want two drives or more in my case. This week I happen to find my 2009 asus eepc 1008, and I had the idea to turn it into a Nas server. I’ll have to disassemble it all, as the plastic enclosure is all broken, and your ikea box seems to be a great idea of a project. I´m trying to learn how to do from scratch, and wold be inclined to buy only a larger hard drive. Any ideas would help, as it’s my first project in this area.